The third Saint's Row will put players at the top of their game from the get-go. After hints of a third Saint's Row game had been whistling through the air, THQ and Volition have announced Saint's Row: The Third. Unlike previous games in the series, where players had to work their way up to the top of the organized crime heap, Saint's Row: The Third makes you the big cheese right away. The game is set years after Saint's Row 2, with the Third Street Saints gang totally in control of Stilwater and you at the head of it. The Third Street Saints have become a household name and even merchandised themselves, earning the attention of a legendary global criminal fraternity called the Syndicate. The Syndicate demands tribute from the Third Street Saints, but they sure as hell aren't going to get it. The battle between the Third Street Saints the the Syndicate will play out in a brand new city. Saint's Row is known for some pretty crazy gameplay segments, but THQ says Saint's Row: The Third will feature the "most outlandish gameplay scenarios ever seen." 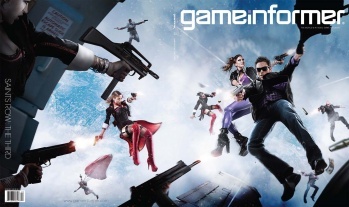 Game Informer's April covers feature two pieces of concept art from Saint's Row: The Third, one of the main character about to board a plane, and another with 10 armed combatants firing at each other from 25,000 feet in the air. More details will be available soon.